Welcome to the Sauerland region. 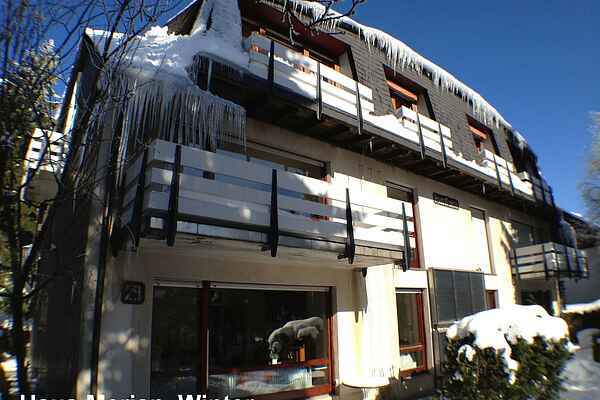 This apartment in the well-known town Winterberg is ideal for groups or large families. On foot, you'll reach the town centre in about 15 minutes, or you can make use of the free bus service. Hiking starts right on your doorstep. During the winter, you only have to walk 5-10 minutes to reach the ski lift carousel in Winterberg as well as the biathlon stadium with numerous well-prepared cross country tracks. From the Brembergkopf mountain, you have access to all 26 ski lifts and ski runs. The ski rental store is situated diagonally across from Haus Merian, about 100 m away (guests staying there will get a discount). Two nice toboggan runs with a sled rental are also nearby. In the summer, you can enjoy the adventure mountain Kappe inclusive bike park, the bike arena, summer toboggan run, bungee-trampoline, Panorama-Erlebnis-Brücke (adventure bridge) & restaurant, climbing forest, numerous hiking trails (Rothaarsteig) and Nordic Walking courses, which are only a 5-10-minute walk away. In the immediate vicinity you'll find lots of bistros, restaurants and après ski bars that serve inexpensive food and drink. The basement of the house has a great play area for children. As a guest, you'll receive the Winterberg Card plus at no cost. In the summer months (from April to October), the card guarantees free admission to numerous attractions (e.g. the summer toboggan run).